On the surface, price and warranty are the standout features of the Nectar memory foam mattress. While we do think the Nectar is a good value, the warranty is less impressive when you dig into the fine print. Find out why in our review. Note: The Nectar mattress was launched in 2016 and has quickly become one of the top-selling online mattresses. As an 11” mattress featuring 4” of pressure-relieving memory foam, a standout feature of this bed is its value. But is it right for you? If you’d prefer to watch rather than read, check out our full Nectar mattress video review above. GoodBed's Take – Who is the Best Match for a Nectar Mattress? The Nectar mattress is an 11” all-foam mattress featuring memory foam comfort layers on top of a foam support core. 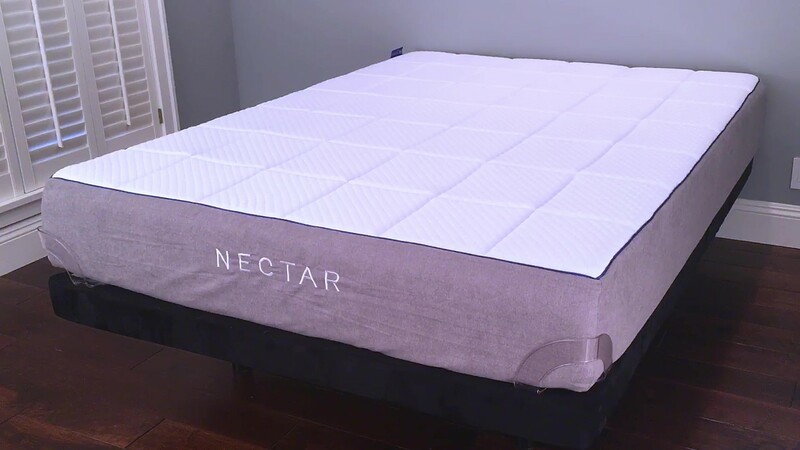 In our testing, we found the Nectar mattress to have a Medium-Soft level of softness (a little softer than Medium) with good overall pressure relief and a lot of slow-responding “memory feel.” It also has excellent motion isolation, making it a good mattress choice for couples who don’t want to feel their partner’s every movement. 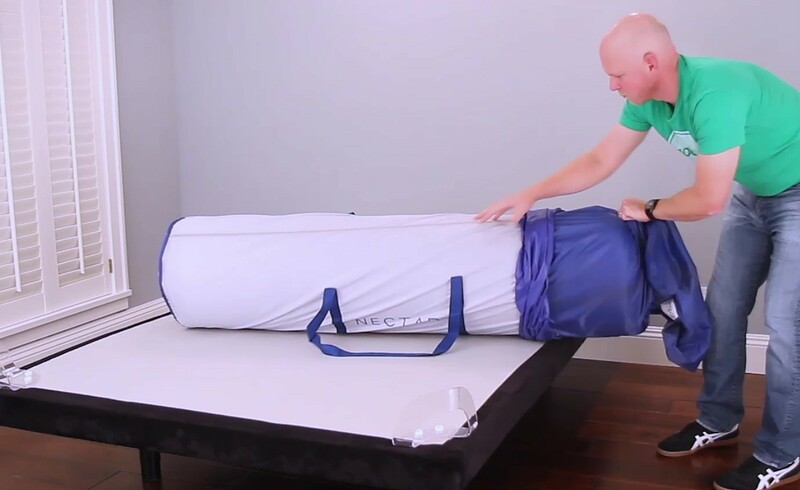 Among our concerns: While our 200-pound tester felt well supported by the Nectar mattress, with good spinal alignment, heavier individuals (e.g., 250 lb.+) might get better pressure relief and spinal alignment other mattress options. And while we were not as impressed with the company’s much-touted warranty (which includes a deeper-than-standard requirement for body impressions), their generous return policy does help mitigate the risk of ordering this mattress online. A standout feature is this bed’s value. Even before discounts, its price is very competitive among memory foam mattresses, and also includes free shipping and returns, along with the outstanding 365-day trial period. Note that the Nectar mattress does not come with a box spring (nor does it need one). You can place the mattress atop the support of your choice, including a separately purchased box spring, a bed frame, platform bed, or adjustable bed frame, and the company sells its own Nectar Foundation. And the Nectar bed comes in just one style—there are no choices to make other than size, something that may appeal to some but not others. 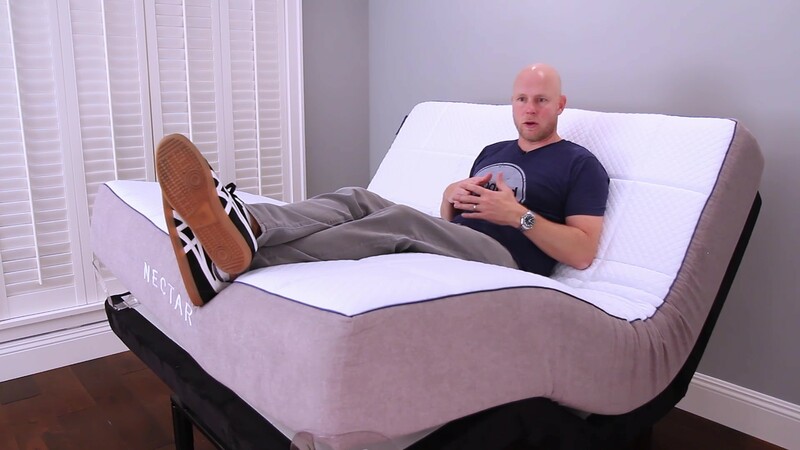 Read on for our detailed report, and be sure to check out the video to see this mattress in action as we put it through our tests. You can also view more pictures of the Nectar mattress on the company website. The layers of the Nectar mattress are characterized by a sharp dichotomy between the very soft top two layers and the much firmer bottom two layers. The top layer is 1 inch of gel memory foam that is actually quilted right into the cover of the mattress, a unique feature we don’t see very often. This foam is very soft with a very slow recovery. Next you have a 3-inch layer of soft memory foam that has a similarly slow recovery. This second layer reportedly contains gel, although it lacks the familiar blue coloring commonly seen with gel foams. Below that is a 1.5” transition layer that is a much firmer foam than either of the top two layers. While it is called memory foam on Nectar website, it definitely lacks the slow responsiveness you’d normally expect from memory foam. The bottom layer is a firm 5.5-inch foam support core. The aforementioned layers of the Nectar mattress are wrapped in a soft cover made with cotton and Tencel, which gives it moisture-wicking properties. It has a sturdy feel and sharp-looking royal blue trim. We class the Nectar mattress as a Medium-Soft mattress (i.e., just to the softer side of Medium). The surface layers of the mattress are particularly soft, with more firmness down below. Especially compared to non-memory foam mattresses, you get more of a “sink in” feeling. Compared to other memory foam mattresses, you feel “hugged” but it isn’t super deep. The gel memory foam top layers are very slow responding, taking their time to spring back. That means the Nectar mattress will give you a good amount of that slow-melting sensation that memory foam is known for. Our standard GoodBed bounce tests showed almost no bounce during our bowling ball bounce test, nor in our 200-pound bounce test. Overall, we thought the Nectar mattress offered very good support, especially for back and side sleepers. Because the top memory foam layers are relatively soft, stomach sleepers and heavier individuals (250 lb.+) may find that the spinal alignment and/or pressure relief are not as good for them. That said, the Nectar bed does have firmer support layers underneath to prevent most people from sinking too far. Our 200-pound tester felt his hips sinking a tiny bit more than with other mattresses, but still well-supported overall. Likewise, we believe that back sleepers lighter than him should also be well-supported in this position. While do have some concern that back sleepers significantly heavier than him might find their hips sinking too much, the firmer support layers could ultimately limit any hammocking effect they may experience. Spinal alignment for our tester in the side position was very good. The conforming memory foam allowed his shoulders to get deep enough into the mattress to allow the top of his spine to remain level. Overall, we believe the Nectar mattress would provide good spinal alignment for most side sleepers. In general, mattresses with four inches of soft memory foam don't tend to be a great fit for stomach sleepers. That’s because in this position the top priority for spinal alignment is to avoid the over-arching of your back (which can lead to back pain) by preventing your hips from sinking too far into the mattress. For that reason, we gave the Nectar mattress a lower rating for stomach sleepers. That said, we do think that lighter stomach sleepers (e.g., 150 lbs. or less) would probably be fine on this mattress, as would occasional stomach sleeping. Overall, we found the pressure relief offered by the Nectar mattress to be very good, as you would expect from a mattress with 4 inches of memory foam at the top. Our only concern on this front was that our tester did feel that his shoulder was getting close to the firmer support foam layers. Although this did not result in any pressure points in his case, heavier and/or curvier people might sink further into the mattress, bottoming out on the firmer support foam, which is much firmer and not as pressure-relieving. With a bowling pin standing upright on the Nectar bed, we tested motion isolation by dropping a 16-lb. bowling ball on it, as well as the whole weight of our 200-lb. tester. In both drop tests, the bowling pin barely moved and never toppled over, which means that motion disturbances on one side of the mattress barely registered on the other side of the mattress. That means the Nectar bed could be a good choice for couples who don’t want to feel their partners movements (or don’t want to feel their dog jumping onto the bed). Memory foam mattresses have a reputation for feeling hot, and if you know you are a “hot sleeper” then memory foam may not be the best choice in general. However, the Nectar bed does have a few features that help manage heat. First, it uses gel in its foam, which helps channel heat away from the body. Likewise, the cotton-Tencel mattress cover has moisture-wicking properties. Lastly, it uses foam that is less dense than than in many other memory foam mattresses, which allows for a bit more airflow. Memory foam mattresses aren’t typically very supportive along the very edge of the mattress—important if you like to sit on the edge of the bed, or if you tend to sleep along the edge. As expected, our tester did experience a substantial amount of dip when sitting on the edge of the mattress. 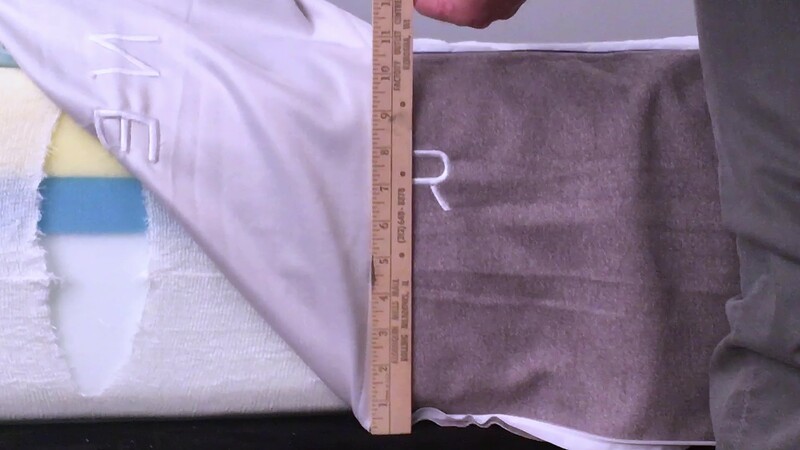 However, the compression was mostly in the top two memory foam layers, with the bottom two layers of firmer foam providing support and stability. More surprisingly, while lying down along the edge, our tester found himself to be stable and well-supported – he felt some leaning, but never felt like he was slipping off. Compared to other memory foam mattresses, the Nectar appears to have very good edge support. This will be important to you if you like to sleep right on the edge, or if you have partners or pets that tend to push you that way during the night. Certain people with mobility issues may have trouble repositioning in general -- for people in this camp, a slow-responding deep memory foam mattress like this one may make things a bit more difficult. Our tester found the ease of moving / rolling around on the Nectar bed to be on par with other memory foam mattresses in this regard, but did not feel this would pose problems for most people. He also found it to be easier to "make your turn" into the relatively softer memory foam in the top layers of the Nectar than it would be on firmer memory foam. For mattress shoppers concerned with the use of natural materials, sustainable manufacturing practices or the like, we offer our subjective evaluation of any efforts taken by the company to make the mattress more green, healthy, or safe. These types of things can be of particular concern for a mattress that is made in China. In the case of the Nectar, the company makes no claims about the use of natural materials in the mattress, however all of the foams used are certified to the CertiPUR-US standard, while the Tencel in the cover is certified to the OEKO-TEX standard, both of which verify that a material has low VOC off-gassing as well as a lack of chemicals and other substances regulated by the CPSC. You can read about the company's eco-policies on their website. When the Nectar mattress was first unboxed, we did detect a faint chemical aroma but felt that overall, the amount of "new mattress smell" was in line with most of the other online mattresses we unbox. If you plan to use your mattress atop an adjustable base, the Nectar is a good choice (and a Nectar Adjustable Frame is available). This mattress is made to bend so using it on an adjustable base shouldn’t put undue strain on it. 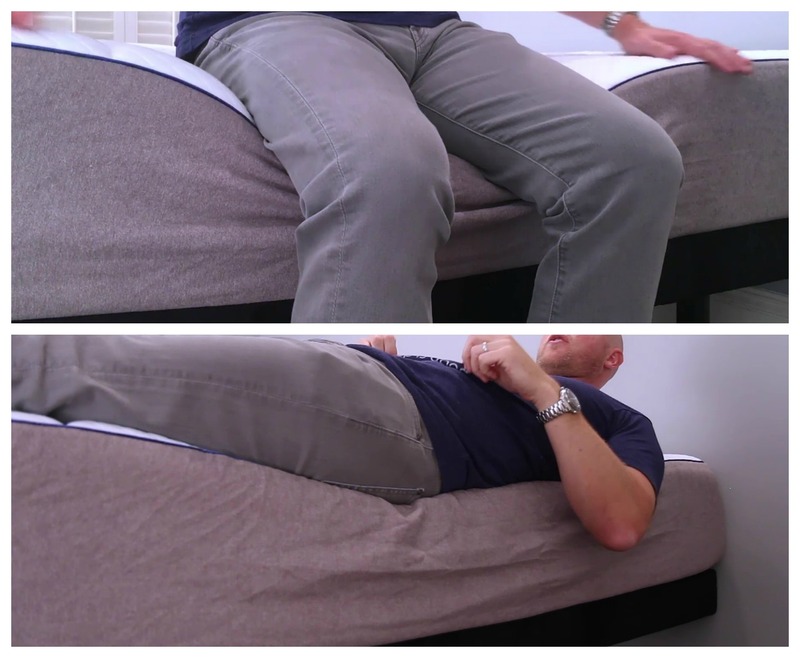 In our testing, the top and middle of the bed stayed in place when raising and lowering the mattress, thanks in part to some clever little bumps on the bottom that seem to help the mattress hold its conformed position even when you get out of bed. We did observe a little bit of quilting bunch-up in the “valley” when both the head and foot were fully raised, but this only happened in places where no one was sitting. While the foot of the mattress didn’t quite lay flat when the foot of the adjustable base was fully raised, this is not uncommon for new mattresses, and in our experience the mattress would likely “relax” over time. The Nectar is an 11-inch mattress with memory foam over foam construction, including 4 inches of premium comfort material (memory foam). 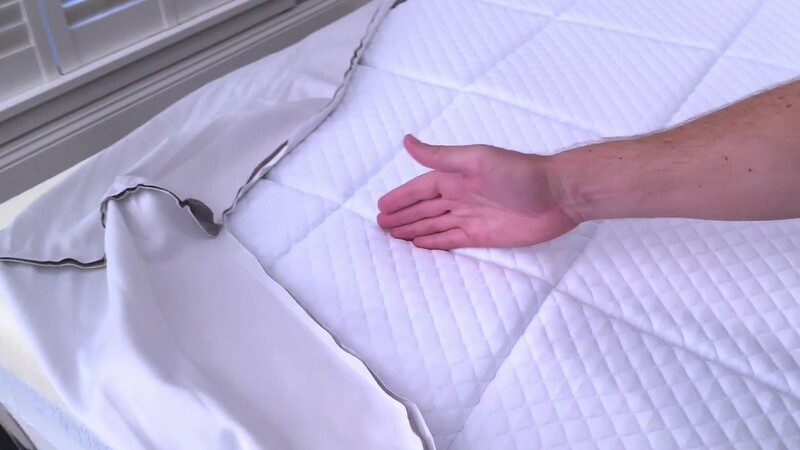 Topping the mattress is a quilted cover, made with moisture-wicking Tencel and cotton. When it comes to estimating the comfort lifespan of a mattress, we tend to use foam density as our best, albeit imperfect, predictor of how long a foam will retain its shape and resiliency. In the case of the Nectar, the foam densities are a little lower than some of the other online mattresses we've reviewed (especially in the memory foam layers at the top). So based on that factor, we wouldn't expect this to last quite as long as those. That said, it also has a lower price than those other options (see our overall assessment of value below). On balance, we feel that Nectar offers a compelling product at a very aggressive price point, part of which is due to the fact that they make this mattress in China. Looking at what you're getting for the money, we believe it compares quite favorably to not only what you'd be likely to find in a local store, but also to its online peers. Nectar’s white-glove delivery is a full-service delivery to your bedroom, including unboxing, set-up, and packaging removal. If you’d like, it also includes removal of your old mattress as part of the same price. Note: During Nectar’s first year or more in business, many of their customers experienced unwelcome delays in receiving their mattress, which has been one of the primary sources of complaints we have seen about Nectar to-date. In seeking an explanation for these delays, we have learned that the company was having trouble scaling production to meet faster than expected initial growth, but that they have now made significant headway toward resolving this issue. As such, we believe that these operational challenges are largely behind them. Nectar offers an outstanding return policy that includes a full-year trial period. Should you return the mattress, the company will not only issue a full refund, but will even come pick it up from you. That combo is well beyond the standard of other online mattress companies, and should provide a lot of additional confidence in giving this mattress a try. Read more about the Nectar 365-day trial on the company website. While Nectar’s lifetime warranty certainly appears generous, it’s important to understand how warranty claims work. One of the biggest, if not THE biggest complaints about any mattress from consumers regards body impressions—the inability of a mattress to spring back, eventually creating a low spot/sinkhole in the mattress. As such, mattress warranties all contain a term defining how big a sag or ‘body impression’ (measured when no one is on the mattress) is considered a defect, and thus covered under the warranty. The industry standard for foam mattresses is ¾”, while it’s typically 1” for other mattress types. Nectar has chosen to cover only indentations that meet or exceed 1.5”. Practically speaking, that means any softening or sagging would need to be very deep and noticeable before the warranty would offer you protection. See: Nectar warranty. While we applaud Nectar for offering a lifetime warranty, given the choice we would generally prefer a 10-year warranty with a ¾” dip requirement over a lifetime warranty with a 1.5” requirement. If you see a review of the Nectar mattress that touts the warranty as a reason to buy it without explaining the indentation coverage, you will know that the reviewer is either not an expert or is simply trying to sell you that mattress (or very likely, both). Summary: Is the Nectar Mattress Right for You? Overall, we found a lot to like about the Nectar mattress. Based on our findings, here’s who we think is the best and worst match for a Nectar mattress. Is the Nectar bed right for you? Take our Mattress Match Quiz to find mattresses that fit your needs, based on your preferences and price range. Looking for more on the Nectar mattress? Visit NectarSleep.com. The Alexander Signature mattress has a luxury look, but how does it fare in our tests?